Atheneum Books for Young Readers, 9781481461313, 48pp. Mary Blair lived her life in color: vivid, wild color. From her imaginative childhood to her career as an illustrator, designer, and animator for Walt Disney Studios, Mary wouldn’t play by the rules. At a time when studios wanted to hire men and think in black and white, Mary painted twinkling emerald skies, peach giraffes with tangerine spots, and magenta horses that could fly. Amy Guglielmo lives a life in pictures. In addition to writing about art, artists, and makers, she is a painter, teacher, and supporter of arts education for children of all ages. Amy once created a Barbie house, equipped with a working elevator, and she is an A-plus hugger. She lives with her husband on the Adirondack coast of Lake Champlain. You can visit Amy online at AmyGuglielmo.com. Jacqueline Tourville’s experience working with children with autism as a public school teacher opened her eyes to the importance of inclusive stories for kids. 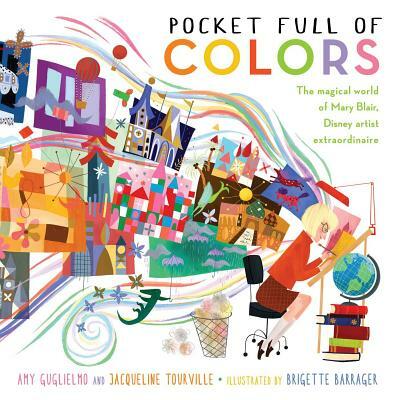 The author of Albie’s First Word: A Tale Inspired by Albert Einstein’s Childhood and coauthor with Amy Guglielmo of Pocket Full of Colors: The Magical World of Mary Blair, Disney Artist Extraordinaire, Jacqueline lives in Maine with her family. Ask her about the miniature log cabin she once built for her cat! Visit her at JacquelineTourville.com. Brigette Barrager is an artist, designer, writer, and the illustrator of Pocket Full of Colors by Amy Guglielmo and Jacqueline Tourville as well as the New York Times bestselling Uni the Unicorn by Amy Krouse Rosenthal. She attended the California Institute of the Arts for character animation, where she earned herself a degree. Brigette spent some time working in animation before taking the plunge into book illustration, where she’s lived happily ever after. She resides in Los Angeles with her handsome husband, cute doggy, and terrible cat. Visit Brigette online at BrigetteB.com. *STARRED REVIEW* "Sunshine radiates past corners and mermaids swim off the page, while rainbow wisps stream from Mary’s paintbrush and trail after her fingers.... The whimsical illustrations will enamor young readers while older kids will learn about a Disney legend as well as new words, such as russet or viridian. An independent, enthusiastic role model, Mary will teach young readers how to value what makes them special and advocate for their talents." "Barrager's hues...are energetic.... A bright homage to Blair's bold work." "Walt Disney Studios were pretty solidly a man’s world when Mary Blair and her passionate love of zingy color reported to work in 1940 . . . [K]ids and their adult readers…will be rewarded with a story of a woman worth knowing, and they will enjoy the ’60s mod colorscape and collage-like retro design that echos Blair’s 'Small World' achievement." "This picture book biography of Mary Blair reveals a woman who thought outside the box and beyond the “rules” of art.... Budding artists will enjoy learning about Blair and her persistence in obeying her instincts and creating art that pleased her." "The aesthetic of artist Mary Blair has had an outsize impact on the children’s book world, and now her life story gets its own book.... Barrager (Uni the Unicorn) laces her vibrant images with visual references to Blair’s memorable work.... An effervescent tribute that doesn’t sugarcoat Blair’s path to success." "Barrager's digital illustrations employ a kaleidoscopic, Fauvist palette and intense patterns in a retro aesthetic that reflects the time of Disney's golden age. Guglielmo and Tourville's text uses deliciously precise color names.... This is a love letter to the color wheel and a prismatic snapshot of a commerical artist's singular style, with a touch of feminism as this woman's vivacious creativity couldn't be dulled by "men in charge," with their "black lines and strict rules.""